Kewl.. but I don't think this is a Light Wallpaper. More like Dark. Anyways, those fireworks are really kewl. A very happy picture, I like the expression in the eyes, it matches the background. Wow the fireworks are so perfect in this wall. *sits and stares* I love the attention to detail too. Excellent work. 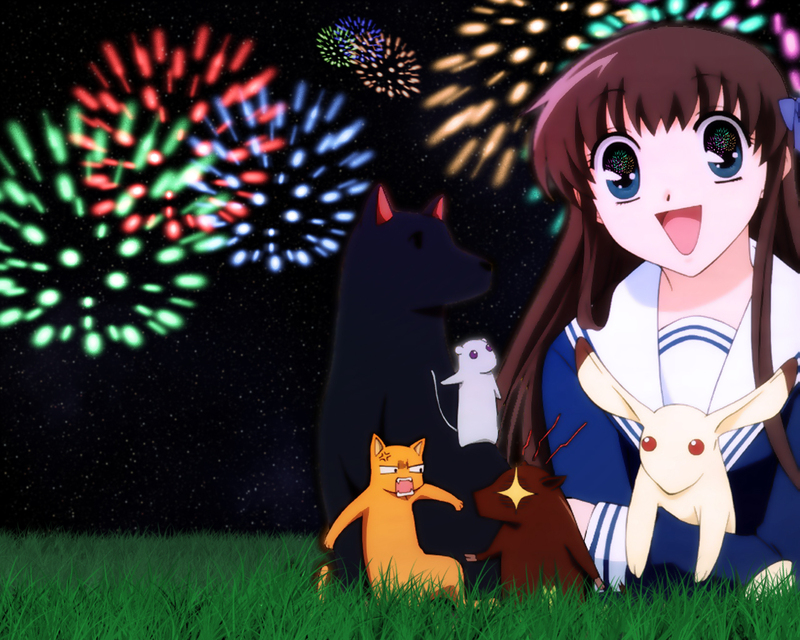 Very nice, I like the fireworks in Tohru's eyes. KYO! *faints* sorry i kjust love dat dude. his so hilarious. i think its a great wallie and dat u did a great job unlike me i dun even noe how to make a wallie. sho stoopid well i'm onli 11 so i dun blame mahself. opps...yer it's a fab wallie! *adds to favs* FRUITS BASKET ROCKS AND KYO IS WAY BETTER THAN YUKI!